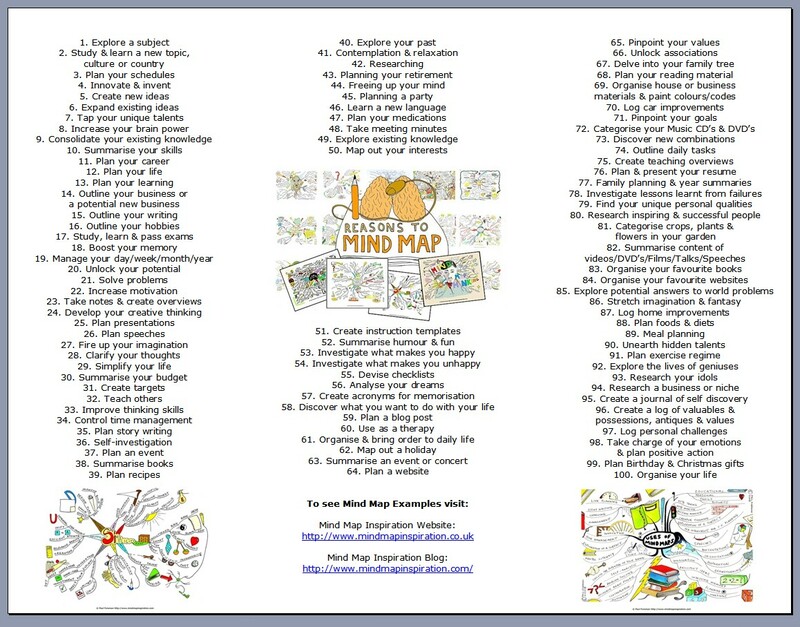 100 examples of how you can use mindmapping whether completely new to mind maps or a seasoned pro. I hope the list helps generate ideas for you. Leave us your feedback below! We thank Americas Cardroom for sponsoring this page. Read about the exclusive Americas Cardroom bonus code that provides a huge welcome bonus to all new members. I am a doctoral student in psychology with an emphasis in technology and learning, My study is titled “Evaluating Digital Technology for Creative/Critical Thinking Indicators Among Adolescents”. In my study, I will compare two groups of students using an art therapy intervention. I am using a unified model of creative and critical thinking (Alghafri & Ismail, 2014; Feldhusen, J. F., & Goh, B. E., (1993); Paul, 1993) to compare two groups of scores collected from the YCREATIVE-CRITICALS assessment (Piawa, 2010). I am looking for an art therapy intervention that will clearly call for both creative and critical thinking skills. The mind mapping intervention sounds promising. Do you have any suggestions for an appropriate intervention? Alghafri, A. S. R., & Ismail, H. N. B. (2014). The Effects of Integrating Creative and Critical Thinking on Schools Students' Thinking. International Journal of Social Science and Humanity, 4(6), 518. Feldhusen, J. F., & Goh, B. E. (1995). Assessing and accessing creativity: An integrative review of theory, research, and development. Creativity Research Journal, 8(3), 231-247. Paul, R. W. (1993). The logic of creative and critical thinking. American Behavioral Scientist, 37(1), 21-39. Piawa, C. Y. (2010). Building a test to assess creative and critical thinking simultaneously. Procedia-Social and Behavioral Sciences, 2(2), 551-559.